Confederate Currency: The Color of Money investigates the importance of slavery in the economy of the South. Artist John W. Jones has researched and documented over 126 images of slavery that were depicted on Confederate and Southern States money. 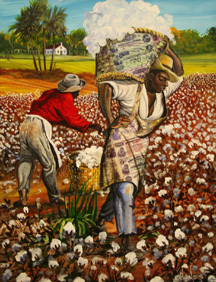 The juxtaposition of the framed Confederate Currencies with the acrylic paintings inspired by the slave images on the currencies makes a very powerful statement on the contribution of enslaved Africans to the American economy. In these paintings, as John says, “history informs art, which in turn artfully reveals more history”. After a very successful and extended showing at the Avery Research Center Museum at the College of Charleston in Charleston (South Carolina), the work is now available as a traveling exhibition. The exhibition has been featured in several publications, including Time Magazine, The New York Times, The Wall Street Journal, The Chicago Tribune, San Francisco Chronicle, The Atlanta Journal Constitution, The Miami Herald, The Boston Globe and Cable News Network (CNN). The exhibition, which broke attendance records at the Avery Museum, has been well received by both black and white museumgoers. People are intrigued and enchanted. Over 95 percent of those attending said that they never knew there were images of African Americans on any American money. Its not something found in any history books. The artist made the discovery when he worked in a print shop seven years ago and a customer asked for an enlargement of one of his Confederate bills. 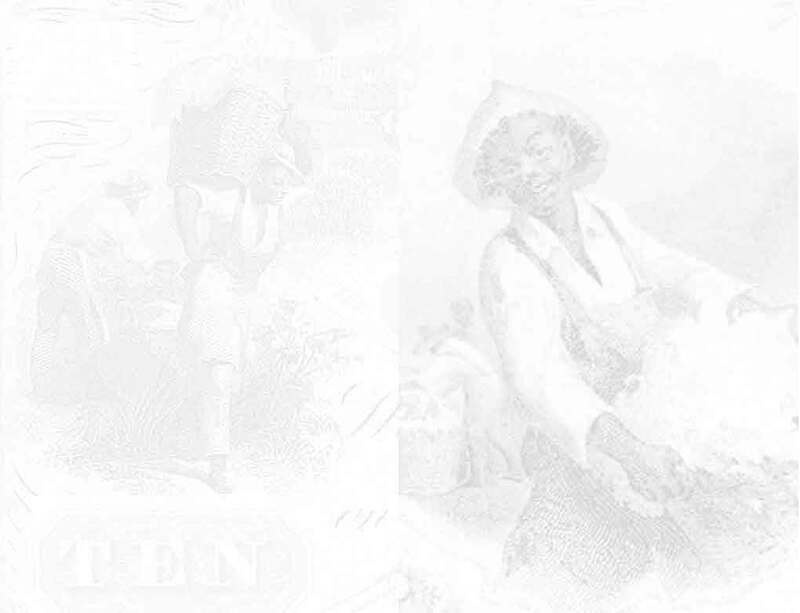 After making the enlargement, a shocked Jones found himself looking at a picture of slaves picking cotton. I am partial to the narrative content of art. I like to use my art to tell a story. In this collection, the paintings innocuously draw you in and free you up to confront the difficult subject of slavery without the fear of censorship. Confederate Currency: The Color of Money was organized by the Avery Research Center for African American History and Culture at the College of Charleston. Booking and traveling arrangements are handled by Exhibitions Plus, Incorporated. Educational and Programming materials include, an exhibition catalog with scholarly essays by Dr. Richard Doty of the Smithsonian Museum of American History, Dr. Wilmot Fraser, and a comprehensive Teacher and Docent Guide prepared by Gretchen Barbatisis, PhD, Professor of Telecommunication at Michigan State University. Confederate Currency: The Color of Money has been used as a medium to engender educational and scholarly discussion. In addition to its value as an art exhibit, it is a poignant, provocative and compelling centerpiece for engaging such issues as slavery, reparations, racial profiling, racial healing, institutional racism and discrimination. Institutions scheduling the exhibition have incorporated it with symposiums, conferences and lectures and have extended it to children and youth through school and community education projects. ©2001 - 2010 John W. Jones. All rights reserved.